Last week my husband and I took a trip up north to celebrate our 26th Wedding Anniversary. 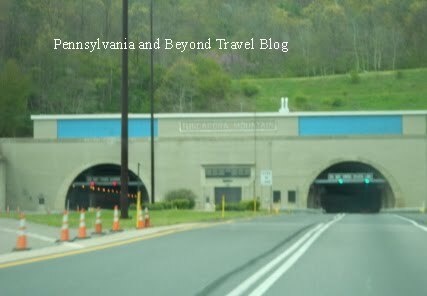 We drove from Harrisburg, Pennsylvania and ended up near Altoona, Pennsylvania. We wanted to get away for a few days & nights and just enjoy some peace and quiet. We took the Pennsylvania Turnpike and headed west and then Interstate 99 and headed north. The drive was absolutely beautiful on the Pennsylvania turnpike and we loved seeing all of the countryside with the many farms and beautiful mountains. With that said, I personally did NOT enjoy driving through all of those mountain tunnels! Seriously, those things totally freak me out! We had to drive through a total of 3 of them and I did snap photos of 2 of them.Hubby doesn't mind them and actually enjoyed driving through them. I almost had a few panic attacks when we were in the mountain tunnels as I don't like feeling like I am enclosed in a mountain (or should I say, under/through a mountain). If you ever get a chance to take the Pennsylvania turnpike from Harrisburg over to Pittsburgh, it really is a beautiful drive (except for the mountain tunnels LOL) and we highly recommend it. There were plenty of clean rest stops along the way for gas, food and potty breaks which was super nice too! Funny that I ran across your blog this morning as we are headed out that way today!! It is a beautiful drive and I'm actually looking forward to seeing spring in the mountains! LOL... there are a lot of tunnels though!